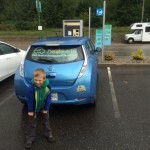 Two trips to Kelowna – and many new Highway 3 chargers! 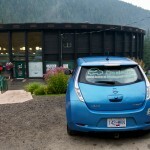 I’ve gone from Nelson to Kelowna twice in the last month and thought I’d share some photos, data, and random insights from each trip… and in between the two trips, several new chargers were added on Highway 3, happy days!! 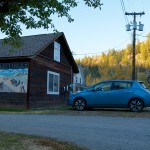 Since I completed my last trip to Kelowna in the spring in our electric vehicle (EV), a 2014 Nissan LEAF, a new Direct Current Fast Charger (DCFC) had come online in Revelstoke, so when I planned this trip, I really wanted to take the slightly longer northern route. However, some searching turned up a nugget of information new to me – the Village of Slocan campground has 240V/50A RV sites! 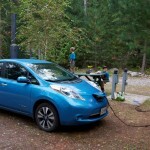 Slocan is about 100 km from Nelson, which would allow us to get to Nakusp in one afternoon, and then camp overnight at their campground and recharge via 30A service (wondering how I use RV campsites to charge? I use an Open EVSE). With that knowledge in-hand, we set off heading north on the last weekend of August. This leg was totally uneventful, which was great! 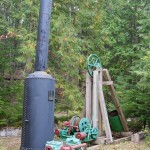 A few of the sites at the Village of Slocans campground have 240V/50A service. The campground itself is gorgeous too. Onto the list of areas to visit for a few days now! 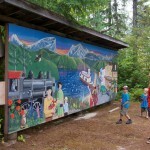 Gorgeous mural of the end of Slocan Lake, on which the Village of Slocan is situated. This waterfall is right beside the campground! It started to rain as we headed to Nakusp, which was perfect with how dry the summer was – it was actually a relief to see moisture. Not to mention it made the thought of the hot springs that much better! 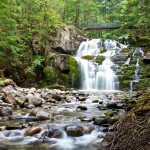 We had enough charge to head straight up to the Nakusp Hotsprings, so up we went. There is a short side walk to stretch your legs before or after your dip – it leads to an amazing timber frame bridge across a very deep and impressive chasm. The next morning we left Nakusp for the ferry across Upper Arrow Lake. 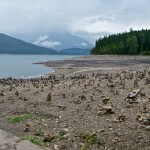 There were a zillion rock cairns at Galena Bay – I think probably from mid-August, when the Rock Creek fire closed Highway 3 and all the traffic was routed through the ferry routes south and north of Nakusp. Heading into Revelstoke, we were planning to use the DCFC, and I was excited to be the first one (to my knowledge, and as shown on PlugShare) to use the unit. Murphy chose this time to raise his ugly head… we arrived downtown Revelstoke to find the unit out of service! As it was Sunday, I didn’t have much hope we would get lucky and have it fixed, but I called Greenlots anyways, and went into the Visitor Center. The lady there called around for me and found out that the station had malfunctioned at some point in the recent past and a part was on order. Good to hear, but that wasn’t helping me out on a Sunday morning when I’m trying to get to Kelowna that day! This is exactly the reason why I suggested at the workshop in June (scroll down to just past the Day 3 Stats table) that the DCFC roll-out would do better to mimic the way that Tesla deploys their Superchargers. Having multiple units (even if it is only 2!) would dramatically increase the apparent reliability of the network. Even if individual units continued to fail at the same rate as now, I posit that it would be much less noticeable to the public, since they would still be able to charge at the other unit and continue on their way (pretty much all of the failures have been a part breaking [with the exception of the Eaton units with the poorly thought out e-stop button; if that button is pushed on a charger, the unit must be reset by a technician]). I would rather have the network with a smaller range and reliable then stretching it out and stranding people for hours on end – it really wrecks your trip planning. At the very least, there should be a Level 2 charger installed in tandem with the DCFC. A field of inukshuks! I suspect they were built during the (apparently astronomically long) line-ups while traffic was re-routed due to the Rock Creek fire in mid-August that closed the highway (and tragically burned a number of homes as well). Well, unfortunately we ran into a malfunctioning DCFC unit once again in Revelstoke. Our batting average isn’t that great so far – of 6 different distinct units we have visited, 2 of them did not work. I think we have had worse luck than most, but unfortunately when there is only one unit at a given site, that is all it takes to severely delay your day when you have planned around a short stop. Let me say it again – please install all future sites with two units! There is a reason Tesla is doing it this way with their Superchargers – they realize that the uptime of any given unit will not be 100% and the time to get a technician onsite for any of these locations is too long when there is only one unit that people are relying on. 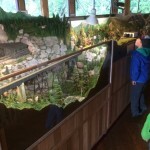 Too bad no one from the model train society was there – this was quite the epic set-up and I would have loved to see it running too! Once again the Superchargers got to tantalize me again, doh! 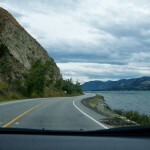 We headed back to Nelson via the southern route – first stop Penticton. This was the first dual-standard DCFC installed in BC and it worked like a charm. It also has the newer version of the CHAdeMO connector, which was easier to use than the other units we have encountered so far. 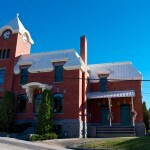 The station is located right downtown with many great cafés and shops nearby. 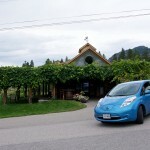 We took the route on the east side of Skaha Lake through the wineries and stopped at a cool strawbale veg/fruit stand (Matheson Creek Farm). 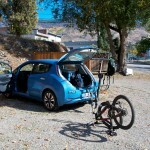 We only stopped for an hour in Osoyoos, just to get enough charge to get us up over the Anarchist Summit and back down to Rock Creek where we were staying the night at Kettle River RV Park. The rest of the day went fine though, and we arrived to Carr’s Landing to clearing weather and a nice sunset over the orchards and vineyards. 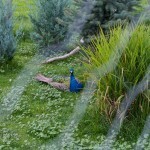 We stopped at the Alan Brooks Nature Center near Vernon the next day; I highly suggest a visit here to learn about the surrounding environments. The area has so many distinct ecosystems, it is a dream land for a naturalist. 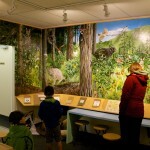 And the murals on the walls of each ecosystem is amazing!! 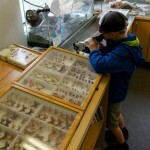 Lots of cool things for the kids to look at – bugs of all kinds, stuffed critters, and an active beehive mounted in plexiglass. 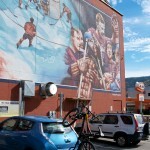 We went straight from Carr’s Landing to downtown Kelowna, then out to Penticton without charging. The DCFC worked flawlessly here thankfully! We wandered through the tunnel below the “Main Street” sign and found a cool cafe to fuel up. 30 minutes was the perfect amount of time to have a potty break and get a snack. 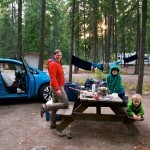 Having dinner at our campsite at Kettle River RV Park, just east of Rock Creek. Gary and Bonnie have been very welcoming, letting us charge on our way through, and accommodating us to tent on our way back, all at very reasonable rates. 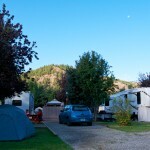 Their campground really is a park – the birds love the trees, they have a great playground for kids, and the Kettle River is only a short walk away. We had a leisurely start to our last day, leaving for Grand Forks at 9:30. 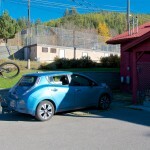 We first stopped in Greenwood at the Deadwood Junction (a café), where I wrote a note to myself to contact the City of Greenwood to suggest they install a charger (little did I know they were planning that very thing!) In GF we charged at the municipal campground (at their 50A sites) and also walked over to the visitor info center. They plan to install public Level 2 chargers sometime this fall, which will be great, since most people don’t have a portable L2 unit like we do. Since we were not in a rush, we also stopped at two other places we have wanted to, but have never made the time on previous trips through in our gas car (see photos below). 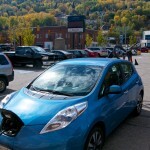 Rather than head down to Rossland to charge, then back up to Nelson, I had pre-arranged for us to charge at the GM dealer in Castlegar, since they are a Volt dealer. The owner was very obliging, and the staff set me up when I arrived (I dropped Marley and Linden off downtown so they could view the sculpture walk). Luckily Cedric and I stayed at the car to have a snack rather than walking away, as after 20 minutes I had noticed that I had only gained a few % of my battery back! Turns out the Volt-specific chargers don’t communicate well with other brands of cars – once I pointed out the problem to the staff, he recalled that a Tesla had come through some time ago and experienced the same thing (essentially it defaults to some safety mode and only delivers the same power as a household outlet). This close to home I didn’t want to hang around for hours, so I called around to a few campgrounds in the Castlegar area and found that the local golf course also has a new RV park with a number of 50A sites, so I collected Marley and Linden to head up the hill to the golf course where we charged with no problems and headed home, arriving late afternoon, in the end only 1.5 hours later than I had planned, despite the charging challenges in Castlegar. We left ourselves lots of time to get home to Nelson on the last day of our trip because there was a few spots in Grand Forks we had been meaning to stop for some time – one of them was this produce stand, Rilkoff’s, just off the main highway, that sells all sorts of local and organic produce, at great prices! 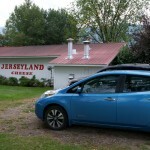 The other spot we’ve wanted to stop for a while is Jerseyland Organics – we buy their cheese and yogurt all the time at the Kootenay Coop Country Store in Nelson. We watched the cheese making through the window for a few minutes, but the kids were fascinated with the pheasants and other critters in the field/barns across from the main building. 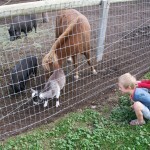 Look at those cute critters! The boys loved it! 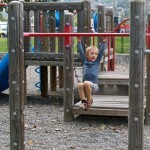 We then continued on to the campground to plug in for a few hours and headed straight to the nearby playground. There is also a very nice BMX track nearby, which the boys have been dying to ride – we’ll come back next year with their bikes so that they can try it out. The visitor centre is only a few blocks away, and I think this is near where they will install the public Level 2 chargers sometime this fall. 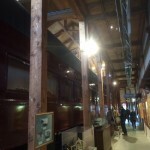 The centre itself is pretty awesome with every changing exhibits and friendly staff. A month later I found myself needing to go back to Kelowna again, this time by myself. So I threw my bike and work laptop in the back of the car with a vague notion to do some riding at different stops, mixed in with work at other stops. As it turns out, a few days before I left, I received an email from Rob MacGregor, the Director, Western Canada for Sun Country Highway (SCH) to let me know that a number of stations had been installed along Highway 3 just in the last few days (we had discussed this route previously and I had the pleasure of meeting Rob at the workshop in June) – from east to west, Creston, Trail, Christina Lake, Greenwood, Midway and Rock Creek! Rob also confirmed that Grand Forks is working on their installation too. 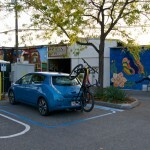 Christina Lake is unfortunately a Tesla-only charger (a High Powered Wall Connector [HPWC]). 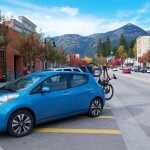 When Grand Forks is complete, it will be possible to take a Nissan Leaf, with no additional equipment purchased, from Nelson to the Okanagan to the Lower Mainland! Big thank you to Sun Country Highway, Tesla, and the host locations!! 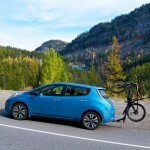 A short-range EV like the Leaf won’t be able to get to the East Kootenay yet though, because the Salmo-Creston Kootenay Pass is at 1,800 m, yielding 1,650 m of climbing, 1,450 m descending, and the distance between Trail and Creston is 125 km. One more charger in Salmo will fix that! Note that for this entire trip, I travelled at or just below the speed limit or with the flow of traffic. 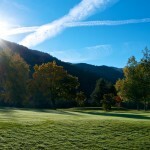 I left on a bluebird Sunday morning for the Castlegar Golf Course RV Park (since the City of Castlegar still hasn’t installed a charger); after a bit over an hour, I was off to Christina Lake. The larches are turning colour in the mountains right now and were a brilliant yellow, so I couldn’t help myself and stopped a number of times to take some photos. At the pass, I had 41% remaining, and I got as low as 39% before starting the descent into Christina Lake – I had regained back up to 46% by the time I reached the lake elevation, and was at 42% at the Christina Lake visitor center. After a quick stop to see their visitor center and to see the Tesla HPWC, I continued to Grand Forks. 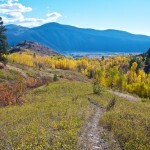 I went for a major route-finding mountain bike ride to a trail called Ripper, which didn’t appear to have been ridden in a number of years – great bones for a trail, but grown over it made for some challenging trail finding. On the lower portion of the ride I came upon the much more ridden Papa Harpold [link to their website], which was an incredibly fun swoopy trail through grasslands and stands of yellow aspen. I was about an hour longer riding then I expected though, so the car had been finished charging for quite some time when I got back – oh well, the adventure is half the fun for me! 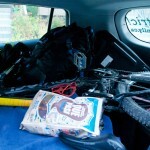 Bike in the car (at least initially) to cut down on the decrease in range from having it on the rack. Fits reasonably ok, with still plenty of room for gear for 1 or 2 people. 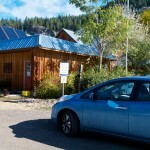 The Tesla charger at the Christina Lake info center – the location was pretty neat – there was a really nice bistro/cafe thing open that Sunday morning. There also appears to be a solar hot water setup on the roof, and to my left there was a pretty cool looking greenhouse. Definitely going back for a trip next spring to explore the area further. Getting the bike ready for my ride in Grand Forks – this was to be my longest charging stop (almost 3 hours), so I thought a bike ride here would be nice, and I hadn’t ridden the area yet. 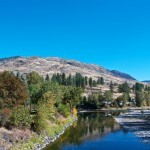 This is only a short walk from the municipal campground – I am looking east along the Kettle River; the Granby river comes in from the north, you can just see the confluence in this photo. I went riding up that grassland hill you can see in the background. 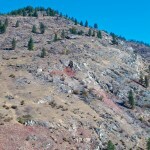 The sumac was a brilliant red on the hillsides around Grand Forks – gorgeous! 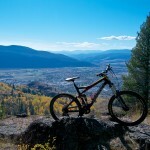 At the viewpoint on the trail “Ripper” – marvellous! The lower part of the trail was called Papa Harpold and was through some flowy grasslands with brilliant yellow aspen stands. Mucho fun! 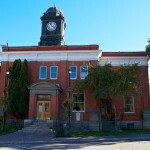 Back in town from my ride, I spotted City Hall, a pretty cool old brick building. I love the heritage buildings down here. Many of the towns I lived in up north lacked this kind of character. The only leg of the trip where I was at all worried about running out charge was from Castlegar to Grand Forks with the bike on the outside, so I had it in the car for this leg; after that I put it on the rack. 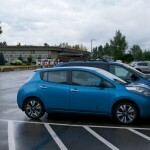 I made three successive stops in Greenwood, Midway and Rock Creek to check out the brand-new chargers, to take some photos, and to add them to PlugShare. 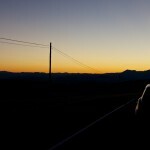 I headed up to the Anarchist Summit on Highway 3 into the setting sun – what a treat! At the new charger in Greenwood, which is at the museum/visitor center. There is one SCH unit, and one Tesla unit, just to the right of that fenced in area to the right of my car. They had been installed only days before I came through. 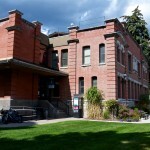 The Greenwood Post Office. This is another small town we want to come back and spend some time in, and thanks to the new charger, we’ll now be able to! 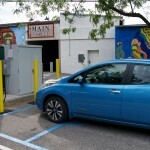 The installers in Midway were brilliant – they mounted the chargers on the back of an antique fuel pump. How awesome is that?! 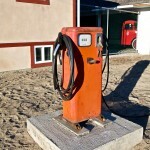 The “fuel” of the future, mounted on an old antique fuelling device of the past. Driving into the sunset over the Anarchist Summit – the views on this section of road are just spectacular. 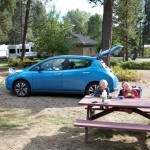 I camped overnight in Penticton, so had a full battery in the AM. I went for a 3 hour ride on one of the local trail networks, 3 Blind Mice, what an amazing job the local bike club has done on those trails! Three hours was barely enough for a sampling – I’ll be coming back for the full course next year, hopefully to do the BC Enduro as well. After running around Penticton for the morning, I still had over 80% of my battery, so I zipped over to Kelowna for my appointment, then charged at the Okanagan College campus for a little over an hour, just enough to get back to Penticton to use the DCFC. 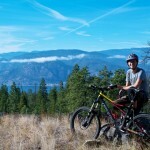 Enjoying myself on the 3 Blind Mice trail network in Penticton – I plan to bring the family back here for a week next year to do some family riding and to participate in the BC Enduro race as well. 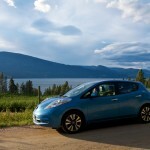 My Leaf also will go to the dealer in Kelowna for its annual check-up during the same trip. 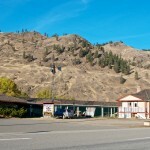 Back to the DCFC in Penticton – right downtown, but barely off the beaten path – perfect location. 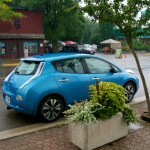 I just wish there were two of them, since this is sure to be a popular stop once there are more EVs in the region. I recorded some video of the fast charging experience, plus shot some interval photos and did some timing of %/min. I plan to edit together a video and post it to YouTube – stay tuned for that (update: video edited and posted!). Interestingly, I didn’t really notice the tapering effect until the battery was around > 75%, and the charger kept going at a good clip right up to 93%. Total charge time from 15% to 93% was 30 minutes. 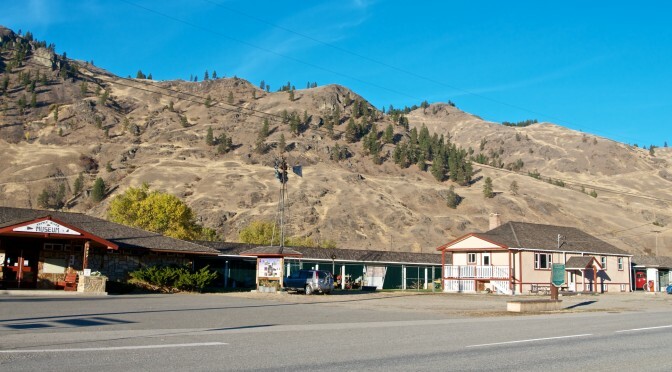 I had left Kelowna around 4:30 pm, Penticton at 6:00 pm, and had only charged long enough in Osoyoos to get over the pass to Midway, leaving O at 8:30 (at the summit I had 24%, by the time I got to Rock Creek, about 20 km further, I had 25%!) I had a quick nap while charging for 1.5 hours in Midway and left there a bit after 11 pm for Grand Forks where I spent the night. The next morning I headed to Kocomo’s to “fuel-up” for the road – I had a good conversation with the owner, originally from Vancouver, who serves the beans at his café that he roasts onsite. 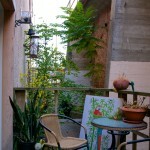 There is a very cool hidey-hole garden in between his building and the next one that has a very neat ambience. I popped up over the Paulson Summit, then headed south on Highway 3B even higher up to the Strawberry Pass, then down to Rossland and Trail all in one charge (32% battery remaining at Paulson, 31% at the highway junction about 15 km further; then climbed up to Strawberry with 18% remaining 8 km further; the lowest I reached was 15%, just outside of Rossland; by the time I had descended into Trail 10 km on, I had regained 10%). I got to work at noon and was able to put in half of a day, then it was back home that evening. 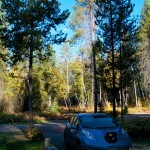 This trip went very smoothly with the new chargers – the Sun Country Highway chargers have been absolutely bullet-proof in all of my travels so far, and the new ones installed were no different. I had no reservations about being the first person to try them out! Back in Grand Forks, I stopped at Kocomo’s (only a few blocks from where the future chargers are likely to be located) – good latte and I love the ambience in the side-yard garden , especially in the heat of summer. 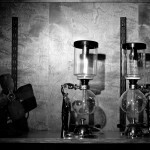 Vacuum coffee makers! The owner had a mix of interesting odds and ends in the cafe, but these caught my eye. 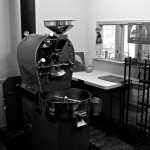 The principle for brewing has been around since the mid 1800’s as it turns out! The small bunsen burner heats up water in the bottom sphere, which as it starts to boil, increases the pressure in the lower sphere, forcing water up the central column and into the upper sphere where the grounds are placed. Once you remove the heat, the coffee comes back down into the lower sphere, strained on the way through a filter. Neat contraptions! The awesome side garden! Facing the other way, there is a pond and Japanese maple. Scenic fall colours with my fall coloured bike on the back; the Paulson Bridge in the background. The Kettle Valley Rail-Trail runs under this bridge and down the valley back to Christina Lake. 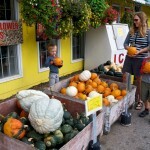 High up on our list of family rides to-do as well. I’d like to take our electric Edgerunner cargo bike on a bit of a camping adventure that way actually – logistics could be a bit tricky though, since it is too large to take on the back of the car, so I would have to ride it from Nelson! 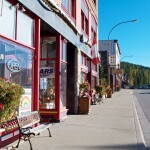 Main street Rossland, with Red mountain above the town. 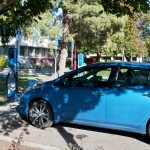 At the Trail Memorial Center – the latest location on Highway 3 to have new chargers installed! In this case, two Tesla units (at 80A too), and one SCH unit at 48A (my car can draw a maximum of 30A). Great location – right next to downtown and the esplanade walkway along the mighty Columbia River, lots to do while waiting! I should note that we really didn’t need to use the heater all that much on either trip, and in any case, rain on the road seems to do more to the range than using the heater. The heated seats and steering wheel really help a lot! 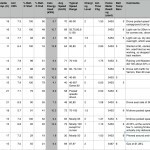 My trip planning spreadsheet for the September journey. We left at 8:15 on the 30th, and arrived about 7:30 that night, so the charger in Revy delayed us by a little over 2 hours. We made some time by the virtue of achieving better efficiency than predicted, meaning slightly less charging time in each location than I had predicted. 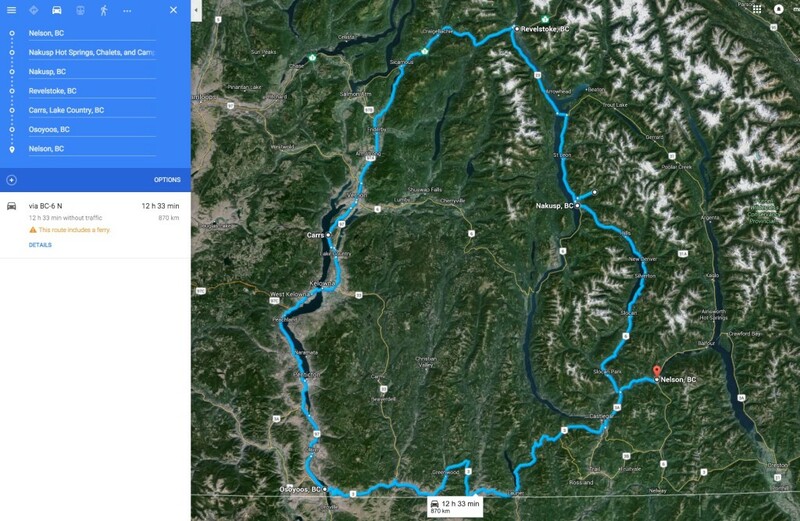 Here is the actual trip data from the September trip to Kelowna via Revelstoke and back along Highway 3. 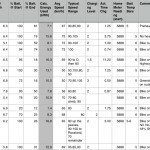 If you compare this to my predictions you will see that I often estimate that I will use more energy than I actually do for legs that involve significant elevation changes; and I think it is skewed more towards trip legs with more elevation loss than gains. I think the car does much better at regaining energy on downhills than I accounted for in my spreadsheet (at least at highway speeds). These are my trip notes from the October trip to Kelowna and back via Highway 3, with the new Level 2 chargers in place. 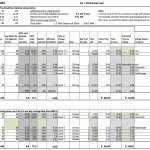 The “calculated energy used” column is obtained by dividing the distance travelled by the efficiency (km/kWh) shown by the car (I reset each of the distance, efficiency, and average speed meters for each leg of the trip). 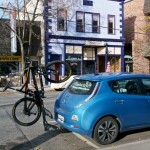 Amazingly my efficiency with the bike on the rack in the middle position wasn’t that bad! I think with all 4 bikes on the rack we approach 15% more energy used for a given leg, but with only 1 in the middle, I think it was more like 5%. 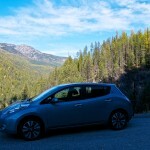 The Nissan Leaf (and most EVs) come with some version of a “range estimator” – on the Leaf it has become known as the GOM (the “guess-O-meter”!!!) Apparently the 2011/2012’s are terrible, the 2013 and onwards are ok, but you have to understand a bit of how they work so that you don’t freak out when driving through the mountain ranges of BC. As near as I can figure out, they have some sort of running average efficiency calculation combined with remaining battery capacity to project your remaining range – the important thing to remember in all of this is that it assumes you will continue driving as you have been.